After striking a nice mid-range note with the Desire 816, HTC is back with a follow-up, the Desire 820. Announced here at IFA, there's some carry over from the Desire 816, including the 5.5-inch screen and plastic body, but the Desire 820 features a little flare of its own. Immediately noticeable is the color scheme. Instead of a solo color all the way around, the 820 sports a two-toned motif comprised of a main base and a trim around the camera, buttons and flash. Also stepping up its game is the front-facing camera. Whereas the Desire 816 had a 5MP front sensor, the 820 jumps up to 8MP snapper. It should deliver high-quality selfies, if that's your thing. What's more, the HTC Desire 820 will eventually be upgraded to Android L, bringing Google's latest OS to a lesser specc'd phone. What else does the Desire 820 have cooking? On the back, the Desire 820 has a f/2.2 aperture, 13MP BSI camera sensor. 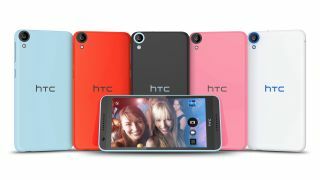 The phone carries a fun bag of HTC's image-enhancing features, including Live Makeup, Photo Booth and Zoe Highlights. Pressing the shutter button will trigger continuous shooting, so you can grab in-action shots and cull out the best at another time. As you might expect, the Desire 820 comes bumping BoomSound. It only managed to snap up a Snapdragon 615 processor, but with integrated 4G LTE Cat 4 connectivity (capable of hitting 150mbps) and a 64-bit, multi-core CPU, users should be downloading, streaming and multitasking with ease. There are no details on battery life, but HTC promises Qualcomm's processor helps maximize performance at the lowest power drain, giving you more juice to guzzle throughout the day. The HTC Desire 820 supports the company's Dot View case, bringing a high-end accessory to the mid-range offering. Look for the Desire 820 worldwide beginning at the end of this month. No word on pricing yet, but in some global markets the phone will support dual-SIM. Yes, but how does the Galaxy Note 4 look?